Bulky wool knit hat. Laurel beanie. Mustard thick yarn. Finished product. Women's/tweens winter hat. 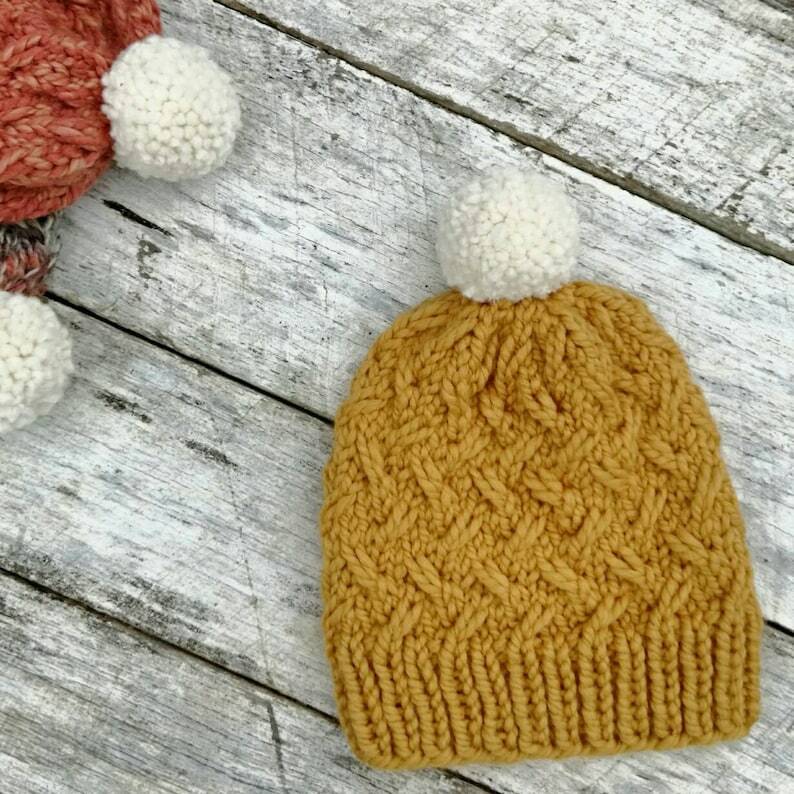 Pompom toque. Yellow winter hat. This hat is extremely soft and squishy and you may find yourself mindlessly stroking it or have to fend off admiring hands when wearing it! Super squishy hand knit hat made by yours truly from pattern by Henry and Jane Handmade. Lion Brand Wool-Ease® Thick & Quick® 80% acrylic, 20% wool. Mustard colorway. Lots of stretch to fit 21"-24" noggin. Bulky wool knit hat. Laurel beanie. Tangerine thick yarn. Finished product. Women's/tweens winter hat. Pompom toque. Orange winter hat. Bulky wool knit hat. Yukon bulky beanie. Multi color thick yarn. Finished product. Women's/tweens winter toque. Navy blue and multicolor. Squishy alpaca knit hat. Laurel beanie. Gray luxe yarn. Finished product. Women's/tweens winter hat. Pompom toque. Grey chunky winter hat. Squishy alpaca knit hat. Laurel beanie. Soft ice blue luxe yarn. Finished product. Women's/tweens winter hat. Pompom toque. Mint winter hat. Squishy wool knit hat. Woven cable beanie. Finished product. Women's/tweens winter hat. Faux fur pompom toque. Blue chunky winter hat. Squishy acrylic knit hat. Affinity beanie. Finished product. Women's/tweens winter hat. Faux fur pompom toque. Dusty pink chunky winter hat. Squishy acrylic knit hat. Affinity beanie. Finished product. Women's/tweens winter hat. Faux fur pompom toque. Pink black chunky winter hat. Llama applique and pompom trim pouch and key fob. Seller was great to work with. Had a minor problem with order and she immediately took care of it. Very pleased with item and great customer service. Practically perfect in every way pouches. Mary Poppins pouch. Embroidered zipper purse. Iridescent fabric bag. Spoonful of sugat. Love this sweet bag! Incredibly fast delivery, too! Matryoshka doll applique black linen square zipper pouch with yarn tassel. Russian nesting doll. Babushka. Love these pouches. Thank you! Happy to accept Paypal and credit card payments. If you are unsatisfied with the item, please contact me and I will do my best to make shopping from Petalz and Finz an experience you would not only be happy to repeat but also to recommend to a friend. I am more than happy to entertain custom requests if you see something you like but want it just a bit more "you". Just send me a convo and we'll work together on what you'd like. Gilmore girls pouches. In omnia paratus. Gilmore girls mustard linen zipper purse. Umbrella embroidery. Gift idea. What would Nancy do? Zipper pouch. Nancy Drew bag. Carolyn Keene fans. Gift idea. Mystery purse. Spring linen monogrammed zipper pouch. Personalized square pouch. Reversible dress and bloomers set. Owls and flowers reverses to gray polka dots.